Fighting the Epson ink chip and winning!! Or how to void your printer warranty on the internet. 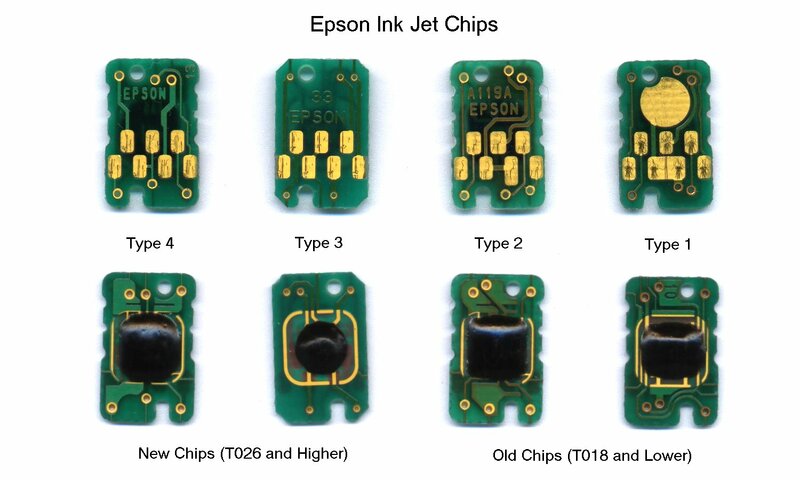 Epson fit small circuit boards to most of their ink cartridges. These record the amount of ink that is estimated to be in the cartridge. I read that the official epson line is that it is for the customers benefit and not an anti-refill device. Whether you believe this or not they are a bloody nuisance to anyone wanting to refill the cartridges or use bulk ink. It also stops people using old cartridges full of solvent for cleaning the heads. Another problem was early printer models didn't check if the cartridge had been changed while power was on. This was good if you wanted to trick the printer into copying a “full” chip to and empty one, however the reverse was also true and you could easily copy and “empty” one into your full one. So epson go to the trouble of fitting chips to cartridges and building all the extra sockets, wiring, electronics and software into the printer so you can use the computer to see the predicted level and it can stop you printing if it think you've used enough ink. High-end Canon's on the other hand make the inks tank clear so you can see and have optical sensor to detect emptiness. This make a lot more sense – unless you are making an anti-refill device that is. Canon almost got my business this time but nobody I could find has run pigment in them – too risky. Before ordering my 2100p I did my homework and it seemed fairly likely a chip reseter would become available at some point and read-only chips as well. I was also cocky enough to think I could crack it myself and I have. It didn't go quite as expected though. Click here for more traces. This is the sort of thing I got. No protocol I ever seen. Obviously synchronous with bi-directional data, very short format. I was confused a little by how short it was - because I expect much better precision for the ink level. After printing a few bits near the beginning of the bit stream did change. It looks to me like the first 3 bits are the chip address the next is a write bit then the ink level, I get the feeling there aren't many bits used to encode it (later looks like 6). The second part is the ink-level and some other stuff (printer serial number maybe) being written into the chip. Seeing I didn't use any ink the bit-stream is identical to the read except for bit 3 – presumably the write bit. This is means 6 bits starting at the 5'th bit in the stream. I'm sure I can reset 3 of the chips by tapping into chip1 signal. Reseting the rest will mean tapping into at least one more. Shorting the data to ground may be a bit drastic but it is only for a very brief time. I hoped the data line would be open collector but this doesn't seem to be the case. Tuesday 1'st October. - reading the chip without the printer. I don't really need to do this but I wanted to see if I really understood the protocol. I wrote code for the micro to act as a master for the chip. I knew the chip was a low voltage part but I hoped it would be 5 volt tolerant and save me some trouble. After getting no sense out of two chips and confirming the printer couldn't read them either I assume I've killed them. I went shopping and bought 3V3 zeners and 330R resistors to limit the output of the micro port to 3V3. Data started to flow. The micro would not read it because is was below the input threshold so I added a pull up to the data pin (on the micro side of the 330R current limiting resistors so the inkchip didn't see 5V). I could then read the contents of the chip. Wednesday 2'nd October – reseting the chip without the printer. What you see here is the printer starting a write sequence at normal speed then after transmitting the address and write bit the clock (2'nd from bottom) slowed down to around 1 Khz. I wrote a “slow write” routine and presto I can write to it. My code simply writes zeros to the first 8 bits in the chip. I repeat the process 7 timse using every chip address. The proof was to take an empty cartridge - zap it and feed it to the printer. The printer said yum and did it's charging thing - then showed a full cartridge on the status monitor. I won't bore you with another image of it. A chip reseter could be made with a $2 micro and not much else – the socket is a problem. Most people can't program micros but for those who can it is trivial now that the protocol is knonw. My hacked about code is too ugly to show here.